Rice University researchers have developed a new ultralight but tough nanofoam called “GO-0.5BN” from atom-thick sheets. The finding is an update to a previous computer-simulation study of “pillared boron nitride (PBN)” reported in July by KurzweilAI. The Rice team has now actually produced and tested the material. The nanostructure’s floors and walls are made of graphene oxide that self-assembles with the assistance of hexagonal boron nitride platelets, and can be made in any size and shape. They also found it can handle a great deal of strain and still bounce back to its native form. In microscopic images, the material looks like a sort of mult-floor nanoscale building, with floors and walls that reinforce each other. It is 400 times less dense than graphite. 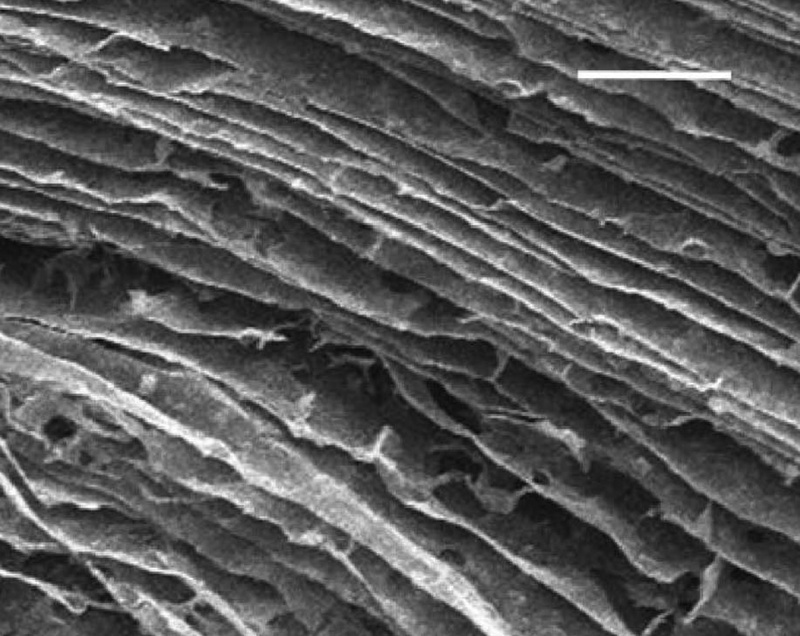 The researchers say the structured foam could find use in supercapacitor and battery electrodes and for gas absorption, among other applications. The research by an international collaboration, led by the Rice lab materials scientist Pulickel Ajayan, is detailed in Nature Communications. Graphene oxide (GO) is a variant of graphene, the hexagonal lattice of carbon atoms known for its superior strength and conductivity. It can be produced in bulk by chemically exfoliating (peeling off into layers) oxidized graphite. Hexagonal boron nitride (h-BN), known as “white graphene,” looks like GO, with the same “chicken wire” array of atoms. It has an ability to form seamless interfaces with graphene, which that has led to the creation of interesting hybrid materials at Rice and elsewhere. 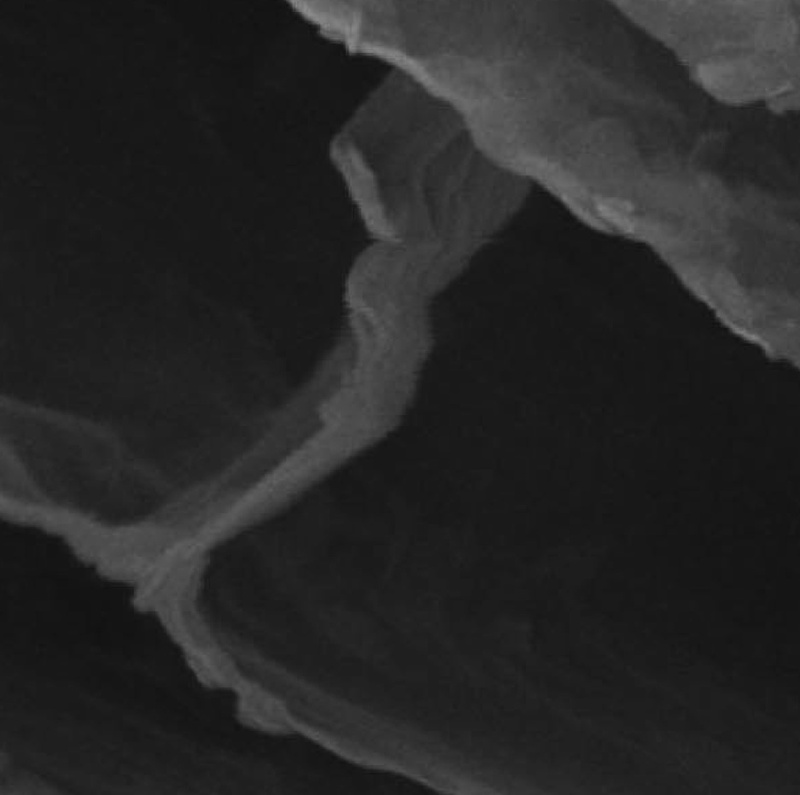 Soumya Vinod, the Rice graduate student who co-led the project, said she and her colleagues expected adding h-BN to graphene oxide would toughen the resulting foam, but “the ordered, layered structure was not entirely expected. “Once we observed the structure, we knew it was very different from the other nanoengineered foams reported and could lead to very interesting properties,” she said. Both components of the new material start as cheap, plentiful powders. Atom-thick layers of graphene oxide and h-BN are chemically exfoliated from the powders, mixed in the proper proportion with a few chemical catalysts and freeze-dried. The resulting foam takes the shape of the container. A close-up look at the foam shows the floors as self-assembled sheets of overlapping GO flakes. Cross-linking platelets of h-BN were uniformly distributed throughout the material and held the sheets together. The h-BN platelets connect to graphene oxide and absorb stress from compression and stretching, preventing the GO floors from crumbling and significantly enhancing the material’s thermal stability, Vinod said. The platelets also prevented the propagation of cracks that destroyed samples with less or no h-BN. Co-authors include researchers at the Indian Institute of Science, Bangalore; the State University of Campinas, São Paulo; Carbon Sponge Solutions in Houston; the University of Campinas; and Central Electrochemical Research Institute, Karaikudi, India. The U.S. Air Force Office of Scientific Research through a Multidisciplinary University Research Grant, the National Science Foundation (NSF) through the Early Concept Grants for Exploratory Research competition and the Indo-U.S. Science and Technology Forum supported the research. The researchers utilized the NSF-supported Data Analysis and Visualization Cyberinfrastructure (DAVinCI) supercomputer and the BlueBioU supercomputer, both administered by Rice’s Ken Kennedy Institute for Information Technology. Low-density nanostructured foams are often limited in applications due to their low mechanical and thermal stabilities. 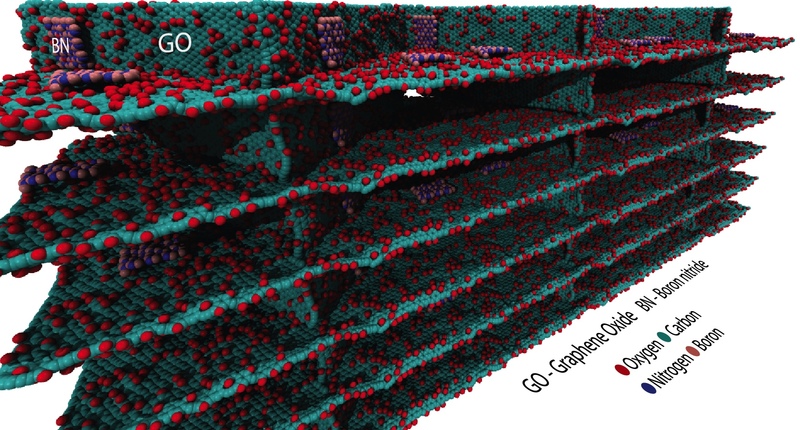 Here we report an approach of building the structural units of three-dimensional (3D) foams using hybrid two-dimensional (2D) atomic layers made of stacked graphene oxide layers reinforced with conformal hexagonal boron nitride (h-BN) platelets. The ultra-low density (1/400 times density of graphite) 3D porous structures are scalably synthesized using solution processing method. A layered 3D foam structure forms due to presence of h-BN and significant improvements in the mechanical properties are observed for the hybrid foam structures, over a range of temperatures, compared with pristine graphene oxide or reduced graphene oxide foams. It is found that domains of h-BN layers on the graphene oxide framework help to reinforce the 2D structural units, providing the observed improvement in mechanical integrity of the 3D foam structure.